A while back, I wrote a post on the number one thing not to say to a working mom, "I could never have someone else raise my kid." But that's only part of the things I've seen and heard. Because working moms are so busy and stretched thin, their voices aren't the predominant ones out there despite 64 percent of mothers with children under the age of 6 working outside the home. The reality of it is that a majority of mothers work. It means choosing your battles. You only have so much time in your day and you want to maximize the time you have with your family. It means things like cleaning, exercising, cooking, self-care, doing your hair and makeup religiously can and will fall by the wayside. It means coming to terms with picking what is more important each day: the attention-starved dog, the pile of laundry, the sink full of dishes or your unshaven legs. It means being forgotten. After so many times of declining plans with people for the aforementioned reasons, they just stop inviting you. For those of you who are not a part of a dual-parent working household, don't stop inviting the people in your life who are part of such a household to events and gatherings! It means so much that people still think of us and want to spend time with us. Certain seasons are busier than others. Now that our son is a year old and sleeping through the night, I feel like I can breathe again and have more freedom to go places with and without him. It just wasn't feasible when he was younger and needed more naps and needed help from me to fall asleep at night. Being forgotten means when you do finally show up to a social event with a baby in tow, it's almost like you're invisible because you've been absent for so long. 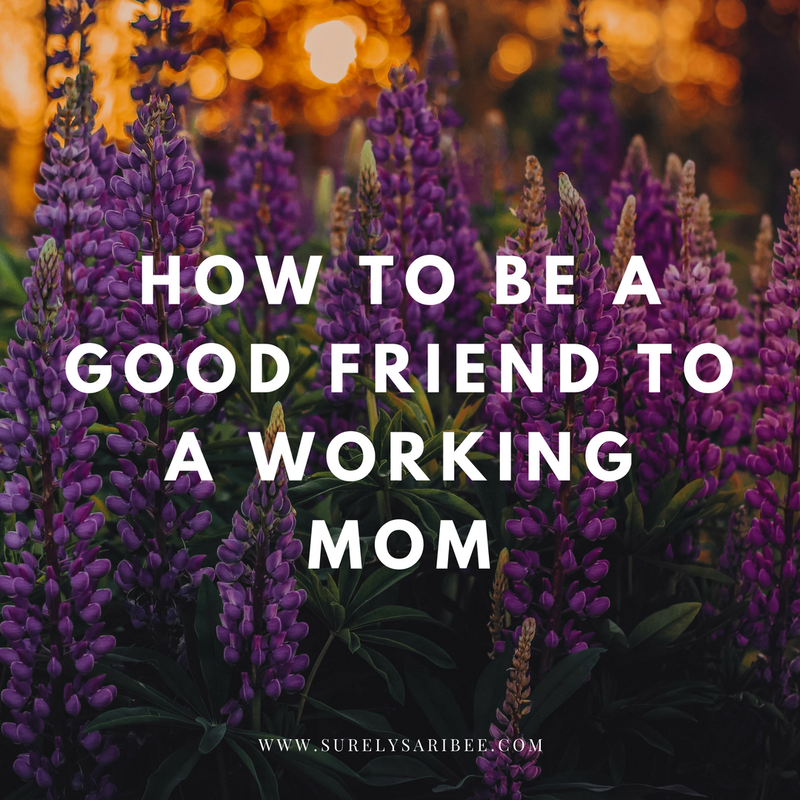 Being forgotten means being part of moms groups who will only plan things during workdays, or seeing the women's Bible study options that are feasible only if you don't work. For most of my son's first year, I admit I played the victim and didn't speak up about the Bible study issue in particular. That was until someone in a Facebook group for working moms encouraged me to speak up and offer to facilitate a Bible study that worked for working women. So I did, and so many women told me how glad they were that I spoke up. It means people assume I don't want to be a working mom, or vice versa. Don't assume. Each family has different, complex reasons why they have both parents working. 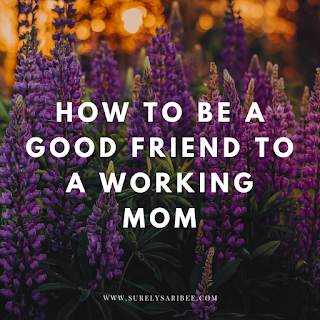 It may start out that the mom only works because it's a financial necessity but then she grows and changes and decides she loves being a working mom! You don't have to feel sorry for us! A new mom sees working motherhood differently than a more experienced mother does, so it really depends on the woman, her situation and where she is in her parenting journey. Don't assume she feels guilty for working, either. It means we have to/get to rely on a village. I've mentioned this before, but I love how my son throws himself out of my arms when we get to daycare. She is able to offer him things that I can't. My son is lucky to have a biological family who loves him and this fabulous woman in his life. He wouldn't have her if I didn't work. He is better off because he has her. But, if my daycare provider has a family emergency, it's full-on panic mode of calling everyone we can to see who can watch our child or else we need to take vacation time or work extra throughout the rest of the pay period to compensate for a day off of taking care of him. It's the same case for when he needs to get a checkup or if he's sick. It's a hectic flurry of figuring out how to live our life with the least amount of disruption. Offer to be a part of her village and be true to your word. Nobody likes asking for help. But when we need to ask for help, it's nice to think of all the people who have offered, send out a few texts and actually have someone give an enthusiastic yes. I have a set of people who are on call for if traffic keeps us from being able to get to daycare on time. I have a set of people who are on call if daycare is closed. Invite her to social gatherings, even if she says no 95 percent of the time. The 5 percent of the time she says yes will mean the world to her to be able to do something outside of her usual routine. Ask her when her kid(s) go to bed, then offer to come by her house an hour after that time with her favorite snack and drink to have some old-fashioned friend time. And tell her not to clean before you get there. For me, social stuff is best done after bedtime, but after bedtime I'm too tired to go out or do anything. If the working mom in your life will allow you to meet her where she is, an hour of talking over a Little Caesar's pizza can light up her week. Ask her how you can brighten her day. If you ask someone how they're doing, the acceptable responses are "I'm good" or "I'm tired" It doesn't actually give a window into anything of substance.